The chocolate brownie is one of my favourite indulgences of all time. Rich, succulent and a melt in your mouth texture are the words that come to mind when describing this recipe for the most delicious chocolate brownies you will ever make. There are countless ways to serve a brownie, but I like to pair my dark chocolate brownies with fresh fruit. The contrast in the flavours really does it for me. There is no one favourite fruit for me and I tend to buy the fruits that are currently in season – blueberries, strawberries, mangoes, passion fruit, etc. If you want to add a little more indulgence, then add a dollop of whipped cream on the side. You can also make a fruit coulis to accompany the brownies. My favourite is a mixed berry coulis that uses a combination of blueberries, strawberries and raspberries. The sweet and tangy flavours work wonderfully with the sweetness of the brownies. Brownies are perfect tea time treats or as sneaky desserts after a light lunch. If serving the brownies by themselves, I also recommend a scoop of your favourite ice cream to accompany the brownie – ideally a mild flavoured one like vanilla or butterscotch. 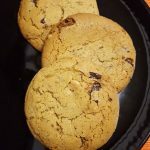 It has taken me several different variations to get this recipe to taste just perfect and now that I am happy with the result, I am sharing my secrets with you. The secret, other than following my recipe, is to use very good quality dark chocolate – this makes the brownie go from good to oh my god. Visit your local supermarket and try to find the best quality dark chocolate – at least 80% cocoa in my opinion. Preheat the oven to 150°/300°F/Gas 2. Grease a 27 x 20cm cake tin with butter and lightly dust with cocoa powder. Use the back of the knife to flatten the vanilla pod, then using the sharp end of the knife slit open the pod, hold one end of the vanilla pod and use the knife to scrape the seeds, mix them with the butter. Melt the chocolate in a heatproof bowl over a saucepan with simmering water, keep stirring until evenly melted. In a bowl whisk the egg yolks with half of the sugar beat in the butter, the melted chocolate and a pinch of Maldon salt. Sift in the flour and cornflour and mix well. In a grease-free bowl whisk the egg whites to stiff peaks then gradually add the remaining sugar. Gently fold the egg white into the chocolate mixture, and pour into the cake tin. Bake for around 35 minutes, then leave it to cool before serving. Garnish with fresh berries.